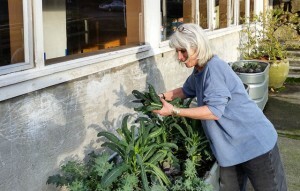 Lee L., MC2 Board member and Community Shelter Meal volunteer harvests kale for monthly event at Maple Leaf. Maple Leaf Lutheran Church donates kitchen/sleeping space for 20 shelter coed residents every night of the year. Welcoming community volunteers to support the shelter with aSunday meal is a monthly effort and very much appreciated. Because they care! The vegetarian meal involves a sit-down time with volunteers sharing the meal with residents. The church also makes the container garden available to access for the community shelter meal prep. The church’s courtyard garden was started in 2015. The grant-funded effort from Seattle Tilthe focuses harvest primarily on donations to the Lake City Food Bank. Board member Lee (pictured) is also involved in donating time to cooking classes at Meadowbrook Community Center and Meadowbrook Community Garden and Orchard. Her commitment and care is invaluable to this community. Thanks for sharing, thanks for caring.